Winning Combo: expandable Ranch with perks in prime location. 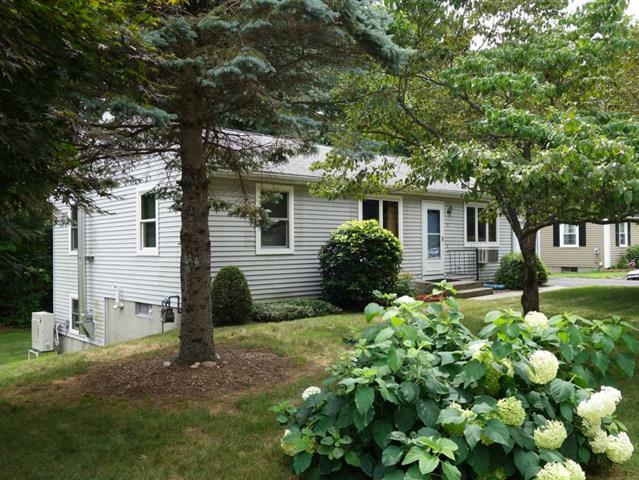 This 3 bedroom, 2 bath home is tucked away at the end of a cul-de-sac in a family neighborhood within walking distance of Ryan Rd school and with convenient access to the Saw Mill Hills Conservation area. A contemporary flare that enlarges the living space is the knotty pine peaked ceiling that arches over the open concept kitchen, dining and living room areas. You will enjoy the mini-split for heat & A/C in this space as well as in the bedroom. Other energy efficiencies: replacement windows & Buderus boiler for natural gas HWBB heat & hot water. Plus, if there is a power outage, the woodstove in the basement that is vented upstairs keeps the house warm. The large, windowed, walk-out basement is ready for finishing, esp. with the laundry & 3/4 bath already there. Enter into the private backyard either from here or through the slider off the kitchen. This lovely property beckons you to your 'home sweet home'.